We are independent Chartered Surveyors who have years of experience of Building Surveys, often known as Structural Surveys, and a wealth of property knowledge. If you need help of advise with regard to your property free phone 0800 298 5424. 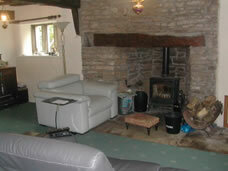 Today most of our have coal fires as a feature in a property, although some of still do rely upon coal fires. Either way, property problems can occur if they are not maintained well. In fact if you have an older property with a chimney you may well have problems even if you don’t use the chimney. Sulphate attack, otherwise known as yellow and orange stains on the walls. A form of sulphate attack that many of us see but don’t know what it is, is when we have a yellow or orange stain coming through on a wall. This can be almost impossible to get rid of. 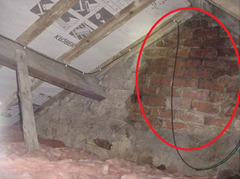 The reason for this is because the staining is coming from within the wall where it’s a chimney or near to a chimney and dampness is coming in through the top of the chimney, reacting with the soot in the chimney and then being drawn out by the heat in the house and general capillary action, leading to the staining. External repair and keeping it watertight. A build up of soot within the chimney that can lead to a fire. We were involved with a fire in a flue once, which is the closest we’ve come to a fire in a chimney. This was a metal flue from cooking that had become covered with grease and a fire had started within the flue that had gone up through the building which, if memory serves us correctly, was a Victorian property that had been sub-divided into residential units, so one of the worst places to have a fire, that is if having a fire anywhere can be considered as anything but a disaster. To have it regularly cleaned. In the case of the flue also to have access hatches at regular intervals into the flue lining to allow the chimney to be cleaned. We would recommend that one or two days per year are spent having a quick look around the property to see if anything has changed, making a note or taking a photograph of the changes. Once such change that may occur could be a crack to a chimney as chimneys years ago were quite substantial. Fires originally, for those of you that are not aware, were literally in the centre of a floor, with chimneys being invented in the form of smoke hoods in around the 13th / 14th Centuries within the bays of timber frame buildings. Yes we really did have fires in timber frame buildings, in fact we once read about a blacksmith who had a thatched roof and was blamed, not surprisingly, for causing quite a large fire in the town that burned a dozen or so houses. From the smoke hood we developed the chimney which was generally brick or stone. Often you see these on the outside of properties as they were add-on features, particularly in the 14th and 15th Centuries when we still had a considerable fear of fire, yet had the means and technology to do something about it by forming a fireplace. What this does mean is that many fireplaces were large and self-supporting and indeed gave support to surrounding elements, such as floors and roofs, although this did change over time. 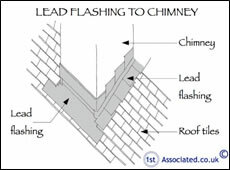 What it can mean is that when a crack is in a chimney it can also affect other parts of a property. Equally it could be that the chimney is cracked due to the lining failing. Again, if you carry out an annual inspection you will note these things and be able to see if the crack gets larger or smaller, or it may simply have been a crack that you hadn’t notice had been there for many years and the property has adjusted and settled into place. However it could also be a structural or progressive crack, in which case you need to get professional advice. Having your chimney swept, what does it involve? For those of you that are new to having chimneys and having them swept for the first time, you should, in our opinion, expect a chimneysweep to be relatively clean despite their job if they are good at their trade. They should provide covers for carpets and often a second cover, and then they will clear the chimney and close it up and seal it so no soot should get out. Into the cloth that they have in front of the chimney there is an opening that they put the chimney brush through and push it up through the chimney, with any soot, etc, falling down. The Chimneysweep we spoke to, as he was busy sweeping a chimney for us, advised that he could generally feel when the lining to the chimney was loose (see our later comments on chimney linings) and the lining would fall to the bottom of the chimney in large chunks if there were problems, with there being whiter dust in the soot mix if it was a lime lining. He also advised that he could also feel from the pushing of the chimney brush up through the chimney flue if the chimney pots were loose at roof level. Normally with a thud as they pushed the chimney brushes up through the chimney flue. The Chimneysweep will then push the brush up through the chimney using poles that are screwed together until the chimney brush comes out of the top of the chimney (see photo). We would always suggest the Chimneysweep pushes the brush out of the top of the chimney. This then makes sure that the chimney pot is secured safely in place. 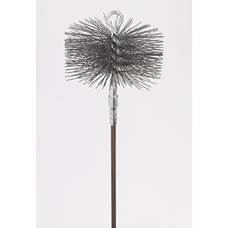 The Chimneysweep then reverses the operation and undoes the poles one by one until the brush is returned. He will then normally put on a face mask as the soot isn’t pleasant and unseal the fire and collect the dust. He should have a vacuum cleaner handy to remove any dust and also any render lining. Chimneys are brick or stone built but they are often lined with either a lime render if it’s pre-war or cement render if it’s post war. These materials are very different, with lime tending to crumble, whereas cement mortar tends to come off in chunks within the chimney. Small bits of lining are generally acceptable as the outside of the chimney is alright, but if large bits of lining come off you can then get smoke making its way usually into the roof as this area often has the brick exposed. We do find in chimneys after the 1950’s/1960’s that they do have a render lining within the roof space which does stop this problem. 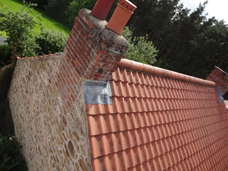 What can you do if the lining of the chimney has failed beyond repair? What normally happens is that a metal flue lining will be put in the chimney and a slurry is then put either side of the flue to hold it in place, effectively forming a lining within the lining. If are buying a property then you may like to see some examples of Building Surveys we have carried out. You will see that our surveys contain photos, sketches and definitions that help to explain the specific problems that we find within the property. There is also an Executive Summary at the start of the survey report that highlights the main issues that we find with the property. Please call us and we can email you some of these examples. Free phone us 0800 298 5424 and ask for an example of one of our surveys. We have carried out surveys on every Era and age, type and style of property. We also use circles and ovals on our photographs and sketches to emphasise problem areas so that you are not left wondering what the problem is. In addition to this if the photographs do not we believe explain the problem enough together with our survey report we also add in one of our own sketches such as the example that is shown here.